Last Friday, Ox Herding featured a video produced by Joseph of Somewhere in Dhamma. Joseph writes a fabulous blog, combining his sharp photography with reflections on Buddhism and the Blues, family life and the life of practice. I forward to meeting Joseph and his family in Korea. And I hope you'll enjoy meeting his blog. For this reason it has been taught, "Practitioners should receive their food as if it were poison. They should accept offerings as if receiving arrows shot into their body." Practitioners of the Dharma should also be extremely wary of kind treatment and flattering words. "Receiving their food as if it were poison" means that you should always be on guard against losing your eye for the Way. And "accept offerings as if receiving arrows shot into their body" simply warns you not to lose the fruit of this Dharma. The Heart Sutra is the most important text in Korean Zen Buddhism and it's chanted several times each day in temples throughout the country. Joseph, who writes Somewhere In Dhamma, produced the version below, combining a great vocal rendition of the chant with his fine photographs. Please enjoy! Thank you for reading Ox Herding. May you awaken to the beauty of each moment! Korea, 4: Wake Up and Laugh! Wake Up and Laugh! is a group blog published (mostly) by people living in Korea. Although posting has been light for the past few weeks, when posts appear they reflect the inspiring teaching of Zen Master Daehaeng. Daehaeng Kunsunim is one of the rare Asian women who carries the title of "master" and her teaching speaks directly to the sincerity and dedication evoked by practice. For the next three weeks, Ox Herding will alternate selections from The Mirror of Zen, the classic inspiration of Korean Zen Buddhism, with posts about blogs that focus on Korean Zen and culture. Written by Zen Master So Sahn (1520 - 1604), The Mirror of Zen serves as an important guide for modern practitioners within the Korean tradition. You may call it "mind," or "Buddha," or "sentient being." Yet you should neither become attached to the names nor make distinctions or understanding. The essence of things is just-like-this. If even one thought appears, that is already a mistake. Sutra teachings rely on words such as these three names ("mind," "Buddha," "sentient being") to express the one thing. Zen meditation teaches that you must not become attached to any words or speech. Picking it up or putting it down. Creating or destroying. These are the actions of a Free Person who is without hindrance. The selection above demonstrates how Buddhas and Patriarchs have freely used myriad expedient means to convey their teachings. Like encountering an old friend in a faraway, foreign land. That's why I was thrilled to find Bap Story, a blog that focuses on the preparation and cooking of classic Korean dishes. Anyone can follow the recipes on this blog and channel your inner Hanguk. Enjoy! In a few days I'm off to Korea for a holiday, where I'll visit with old friends and meet newer friends I know only from the Internet. And, of course, I'll spend time in ancient temples, bustling markets, and the other sights and sites that make Korea so interesting. This Sunday I'll give a dharma talk at Hwa Gye Sa in Seoul (shown in image above), the home of the Seoul International Zen Center. 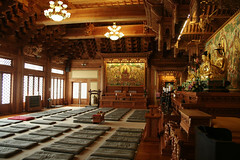 And a few days later I'll visit Mu Sang Sa, the main Korean temple of the Kwan Um School of Zen (photo below). Over the next three weeks, Ox Herding will feature blogs about Korea and Korean Zen. These posts will alternate with teachings from the great Korean master So Sahn (1520 - 1604). I'll have limited Internet access on this trip (a real holiday!) so please feel welcome to write comments, knowing that I won't read them for a while. Photos by Flickr users Martin Roell and Arunas Kulikauskas. Used under Creative Common License. Yesterday Susmita Barua left a comment on Ox Herding which led me to her blog: Deep Conscious Capitalism > Mindful System Change; Transforming Self-Society-Economy: Budha Way. Can we as conscious citizens and engaged Buddhists create our collective future mindfully? It is a social engagement Intention experiment to consciously shift the 'Evolutionary Path' of the planet to create an abundant yet sustainable human-scale economy, a global culture of peace, partnership, genuine free market, unlimited potential for conscious living and right livelihood. Be part of a shared dream, collective solution and joyful evolution. Susmita began the blog in 2007 (why haven't I discovered it before?) and the posts are exactly as promised: deep, provocative examinations of how to live correctly within a capitalist economic system. Please check it out and add the site to your blogroll. I sit here at my desk, surrounded by wires and cables, papers and books, and computers and phones. And in this nest, I forget completely that not everyone experiences the world in this way. In this moment, I'm stunned at how little awareness I have of life beyond the display. But life goes on in strange and beautiful ways, as today's video makes abundantly clear. It depicts the Surma of Southern Ethiopia, people who live in quite a different world than mine. My world would probably seem equally strange to them, but perhaps not as beautiful. Thank you for reading Ox Herding. May you soon step away from your display!